... Once you're done reading it, that is. And you really should read it; it's pretty great. Mononimal cartoonist Seth delivers an intriguing, multifaceted meditation on the life and death of a fictional small-time television personality. It's a thoughtful, quietly compelling read: His omniscient narrator keeps apologizing to us for getting the details wrong, while a parade of Sprott's colleagues and family members offer up eulogies that intersect in oblique, surprising ways. 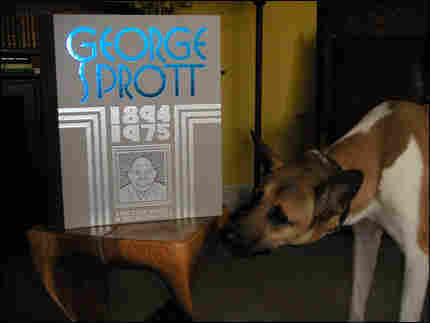 George Sprott was originally serialized in the New York Times Magazine, but now that it's been bound in a handsome single volume, you can pick up on the momentum of the thing, the intricacy of its structure and the melancholic grace of the writing. Seth mixes in flashbacks from Sprott's life as an Arctic explorer -- we turn a page, and a coldly beautiful blue-white landscape stretches before our eyes. Turn the page again, and we're back in the sepia-toned routine of television's golden age. And then there's the sheer size of this great honking slab of a book. 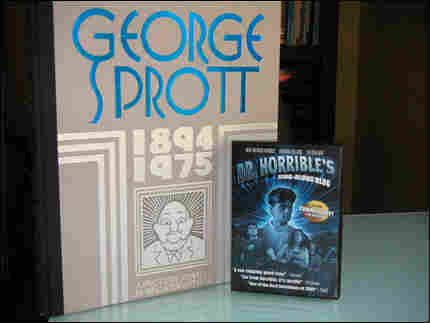 At 12 inches wide and 14 inches long, George Sprott is only the latest in a slew of graphic novels that seem to have been proportioned for natives of Brobdingnag. Last year's mammoth comic anthology, Kramer's Ergot 7, clocks in at a massive 16 inches by 21 inches. Seaweed, Ben Balisteri's loopy all-ages seafaring adventure, measures 12 inches by 15 inches; even DC and Marvel's regularly published Absolute and Masterworks collected editions are super-sized. Titantic tomes repurposed, after the jump. It's easy to understand the XXL appeal of it all, though, leafing through George Sprott's gorgeous pages. You'll want to pore over the artist's clean lines and cartoony shapes, and the sheer steroidal size of the volume makes it easy. But what are we supposed to do with the thing after we've read it? Few of us own bookshelves capacious enough to accommodate art tomes this big unless we live on the Upper West Side or inside a West Elm catalog. We can slap it on top of the coffee table, sure -- but that's only a temporary solution, as a home has only so much surface area. Eventually we'll need to cede that precious coffee table real estate back to, you know, coffee. In fact, a hearty smack with the broad side of this book would prove equally effective against most of the small-to-mid-sized creatures of land or air that may beset you in your travels, so let's go ahead and consider it a bat-stunner/mole-whacker/ocelot-basher/coyote-knocker/tapir-thrasher/hawk-paster/wolf-spanker/boar-clubber/puma-socker/basilisk-puncher/harpy-whomper/roc-smiter and, for good measure, a perfectly serviceable ROUS -cudgel. Your turn to host the book club? Set out the Monchego and Montrachet in a cheeky way that says, "I read books!" 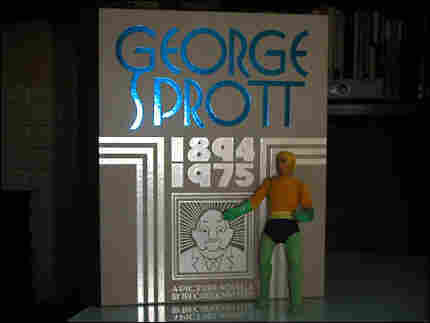 Given the cover design, it's obviously well-suited for those occasions when picking up clients named George Sprott. But it does prominently feature a large image of a fat bald white guy, so it's also likely to work when picking up auto executives, government officials or that one old dude from Cocoon. Show off your indie cred while keeping Junior out of the air vents.